When I originally saw The Roosevelts in 2014, I was most impressed and moved by how Burns and Ward develop their argument that TR, ER, and FDR “overcame… the traumas of their childhoods” and young adult lives to become vibrant political figures. 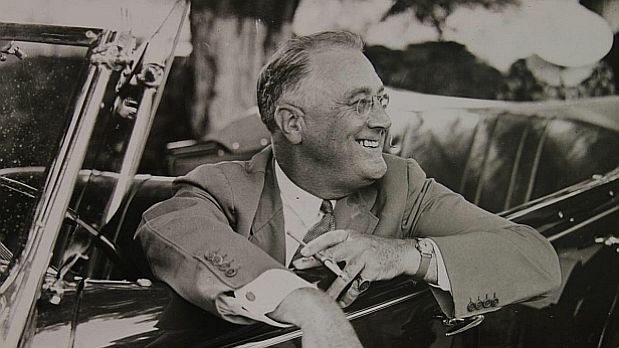 Stricken with polio at the age of thirty-nine, FDR returned to public life, running successfully for President in 1932. He had to confront two of the most serious challenges in American history – the Great Depression and the Second World War – and he was successful. It is extremely valuable to be reminded about the importance of the role of government in creating the progressive legislation of the 1930s and 1940s that reduced inequality and created the white American middle class during the postwar decades. I would have liked to have seen reflections on the Roosevelt legacy that persist into our time: the role of government, the safety net and the role of gender equality in the economy. Conservative pundit George Will opened up that possibility with his assessment that the government would not just “provide the conditions for the pursuit of happiness” but “deliver happiness, understood as material well-being.” But I do not expect anything from a Burns documentary that might give rise to controversy as he prefers to play it safe and not alienate his audience. President Franklin Roosevelt at his home in Hyde Park, New York, in 1937. I recently revisited the series after reading Patricia Bell-Scott’s extraordinary duo biography, The Firebrand and the First Lady: Portrait of a Friendship Pauli Murray, Eleanor Roosevelt, and the Struggle for Social Justice (Alfred A. Knopf, 2016). My initial enthusiastic response to the film was somewhat tempered becauseThe Roosevelts and the book companion of the same name (Alfred A. Knopf, 2014) veers toward downplaying race relations and the conditions faced by African-Americans, as much through omission as commission. True, his administration did ensure that at least one third of all black Americans did receive relief of some kind. But whatever directives were issued by architects of the New Deal, such as Roosevelt’s close advisor, Harry Hopkins, that there should be no discrimination against anyone receiving federal assistance, were undercut by local administrators who ignored those directives. Blacks were the first fired and last hired, and in every New Deal program such as the CCC, which provided work for the unemployed, they were segregated. Although the G.I. Bill of Rights, perhaps the most popular legislative program of the New Deal because it provided tuition and expenses for white veterans to go to college or trade schools, as well as low-cost mortgages and low-interest loans, was intended to serve all veterans, blacks faced discrimination at every level enabling only a few to benefit from it. Little of what I have written above about the discrimination faced by blacks is addressed in The Roosevelts. Burns and Ward rightly note the importance of the G.I. Bill but do not even mention its impact upon African-Americans. It is not as though they ignore race issues. They acknowledge the importance of black labor leader A. Philip Randolph whose threat of a March on Washington persuaded FDR to order the opening of war-industry employment to blacks in 1941, the first political act against discrimination since Reconstruction. Even though FDR was the first president to publicly call lynching “a vile form of collective murder,” Ward admits that the President shied away from aggressively promoting civil rights or promoting an anti-lynching bill that lay comatose in Congress for fear of alienating Southern Democratic whites whose political support he needed for his New Deal programs and his war effort. He does not mention that ER publicly supported the measure. Yet blacks who could vote gave their support to the Democratic Party since they recognized that the Roosevelt administration, especially the First Lady, was at least hearing their aspirations, as evident by their widespread grief after FDR died. 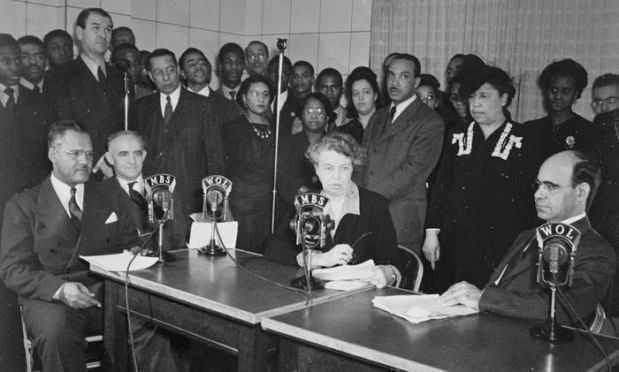 Eleanor Roosevelt at radio station WOL, Washington, D.C, in 1943, presenting a program devoted to African-Americans. In their earlier collaboration, The War, on the American experience of the Second World War, which I think is superior, Burns and Ward address societal problems and FDR’s failings more substantially – the corrosive racism that created the Jim Crow military and fueled urban riots around the country as well as FDR’s Executive Order that interned in barbed-wire camps between 110,000 and 120,000 Japanese men women and children, two-thirds American citizens. ER was vehemently opposed to the internment but was unable to persuade the administration that the evacuation was unjust, an issue touched upon in The Roosevelts but Eleanor’s views are not included. The historians in The Roosevelts do not deny ER was her husband’s “liberal conscience” and that she continued to support progressive causes after his death. But they offer a more positive assessment of FDR by stating that although she may have been the greater reformer, he was the better politician. At the same time, they acknowledge that the President wanted to be around women who admired him and would not place demands on him – like his wife. Nor does FDR (and Burns and Ward in either series) seem much interested in the plight of Jews fleeing Nazi Europe. Although Roosevelt spoke out against Nazi crimes, the series ignores how the President refused to raise immigration quotas and failed to respond to the cabled requests from passengers on the ship, St Louis, with seven-hundred refugees on board, to offer them asylum, which he could have done with an Executive Order. He did, however, respond in 1944 to his friend and secretary of the Treasury, Henry Morgenthau, to establish the War Refugee Board that provided the funds to assist 200,000 refugees to escape. This subject is more fully and powerfully explored in the PBS series The American Experience, whose 1994 America and the Holocaust (available on DVD) wonderfully integrates both the top-down political history with a bottom’s up profile of one family. 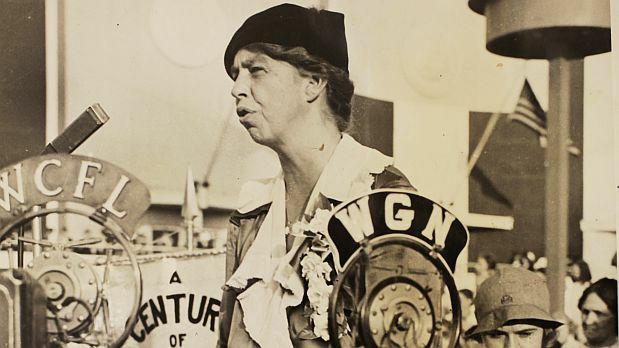 Racism and refugees rarely intrude on The Roosevelts because Burns and Ward are more interested in focusing on the personal lives of the Roosevelts and in a top-down history that highlights the major accomplishments of their three protagonists. By contrast, The War profiles several ordinary Americans over the course of the war and its effect upon them in addition to the political and military decisions that made victory possible. End of Part 1 of Eleanor Roosevelt through Different Lenses. Part 2, which will look at Patricia Bell-Scott’s 2016 book, The Firebrand and the First Lady, with be published here later this week.